A Parochet is the cloth that covers the doors of the Ark containing the Torah scrolls in a synagogue. This one is decorated with traditional symbols and inscriptions intended to focus attention on basic beliefs, including the Tablets of the Law, forming the centre piece of the design. Around them are twelve scenes representing important festivals and Sabbaths on which there are special readings or on which special events are commemorated. Each scene is surrounded with relevant quotations. One Hebrew inscription reads "All work was completed by Ellul 5436". This date equates to August-September 1676 AD. A band immediately below the central panel has been added later, with the date 5471 [1711 AD] and the donor's name, the honoured Joseph bar Haim Segal Polacko. 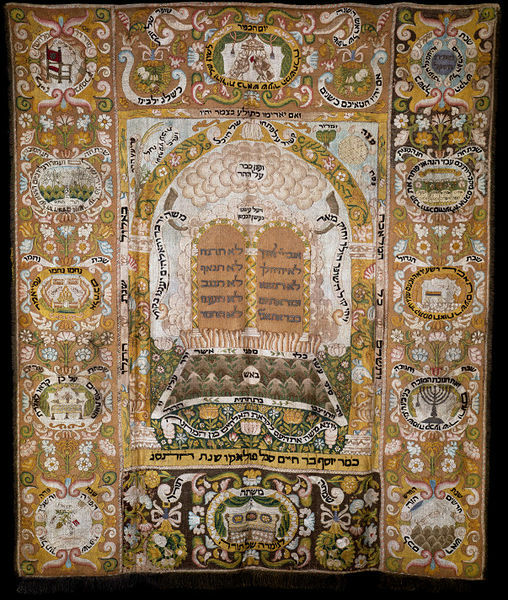 There is a binder for the Torah Scrolls in the Jewish Museum in New York, which was embroidered by Rikah Polacko in 1662. Rikah is thought to have been the mother of Joseph Polakco and she may have embroidered this curtain. A parochet (Torah Ark curtain) embroidered on plain-woven linen ground, extensively pieced. Thread count 26 x 16, with the embroidery worked over four threads. The embroidery is in silk and silver gilt thread in brick stitch with some French knots, and couched metal thread in the text of the Ten Commandments. Most of the black inscriptions have been reworked in satin stitch. The borders were worked separately and then the whole was assembled and the seams embroidered over with a decorative pattern. Silver gilt fringe on three sides. The Tablets of the Law form the centre piece of the design, and this is surrounded by twelve scenes (one top and bottom and five along either side) representing important festivals and Sabbaths on which there are special readings or on which special events are commemorated. Each scene is surrounded with relevant quotations. The sequence in which they are placed is not chronological, and may indicate a complex iconography. An inscription in the upper part of the narrow border around the central panel states that "All work was completed by Ellul 5436" [August-September 1676 AD]. A later band immediately below the central panel has the date 5471 [1711 AD] and the donor's name, the honoured Joseph bar Haim Segal Polacko. Shabbat Zachor, Shabbat hol Hamo'ed Sukkot, Shabbat Nachamu, Simchat Purim, Shabbat Parah, Simchat Torah, Shabbat ha-Kodesh, Shabbat Hanukkah, Shabbat ha-Gadol, Shabbat Hol Hamo'ed Pesach, Shabbat Shekalim and Yom Kippur. Purchased from Caspar Purdon Clarke (later Director of the South Kensington Museum), together with 411a-1877, for £30. Historical significance: Like most Parochets (the cloth that covers the doors of the Ark containing the Torah scrolls in a synagogue), this one is decorated with traditional symbols and inscriptions which focus attention on basic beliefs. Although the South Kensington Museum was among the first museums to collect Jewish material, the ritual and cultural significance of these acquisitions was probably considered far less important than their interest as textiles. This parochet was acquired before the Anglo-Jewish Historical Exhibition held at the Albert Hall in London in 1887. That exhibition marked an important point in the history of Jewish collecting, and the development of the study of Jewish ritual art. It prompted the formation of Jewish museums in various continental cities, but little additional Jewish material came into the V&A's collection until the 1950s. As far as is known, most Jewish embroideries from Northern Italy were embroidered by women. 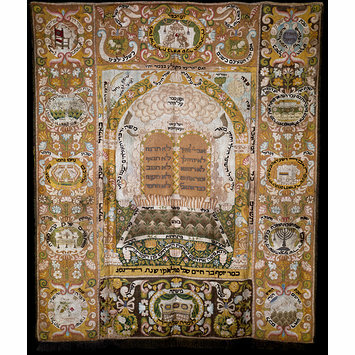 There is a very similar Ark Curtain in the Jewish Museum, New York, which has a date equivalent to 1698, and was embroidered by a woman called Leah Ottolenghi. 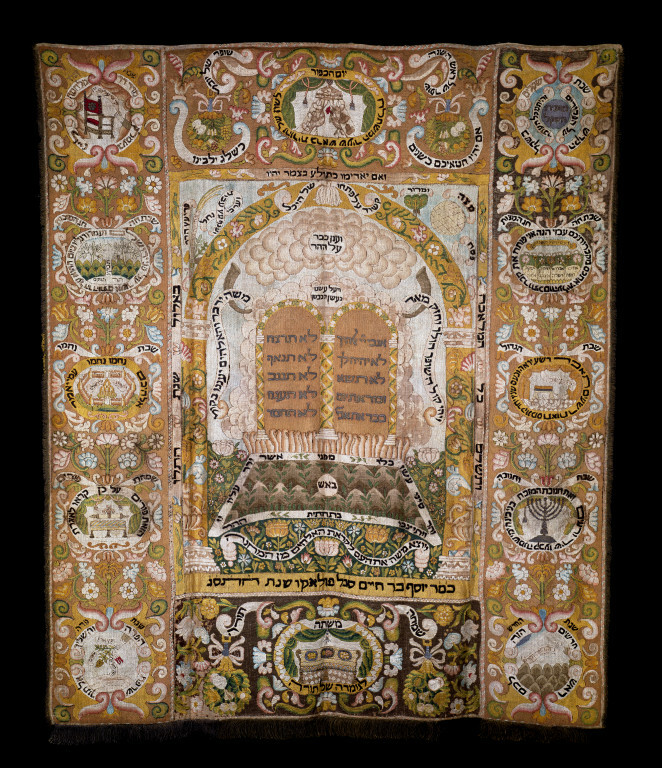 Another Ark Curtain in the same museum has the date equivalent to 1680; it was embroidered by Simah, wife of Mamahem Levi Meshullami. Also in their collection is a narrow binder for the Torah Scrolls which was embroidered by Rikah Polacko in 1662 (inventory number 1988-21, given by Cora Ginsburg).. Rikah is thought to have been the mother of Joseph Polakco whose name appears on the V&A's curtain, and she may have made the curtain fourteen yeas after she completed the Torah binder. The design of the curtain may have been made by a professional artist, possibly one who illuminated ketubahs (marriage certificates). Brides received a written contract from their grooms, which was usually highly decorated. Late 17th marriage certificates from Northern Italy can be compared with these embroidered synagogue hangings, as all are decorated in an artistic style which included formal vases of flowers (seen in the V&A's curtain in the lower part of the pillars forming the central arch). Parochet, linen embroidered with coloured silks and silver-gilt thread in a variety of canvaswork stitches, Italy, 1676. Jennifer Wearden 'A Torah Ark Curtain: Important Symbolism in a Jewish Hanging' in "The World of Embroidery", volume 48, number 5, September 1997, pp. 264-265. Jennifer Wearden 'Beauty Enhances Ritual: two Italian 17th century embroidered synagogue textiles' in "Proceedings of The Textile Society of America 1996 Symposium" 1997 pp. 156-164. Susan Nashman Fraiman, "Beyond the Parochet, Three Italian Torah Ark Curtains, Their Makers and Their Meaning", Master's Thesis, The Hebrew University of Jerusalem, 1998. Two dates are incorporated into the embroidery. the date equivalent to 1676 is when the work was completed. The date equivalent to 1711 is when it was donated; this is a later addition. The difference between the two dates may indicate that the curtain was first made for private use within the home and was then donated to a synagogue. The extensively pieced ground also suggests a domestic rather than professional origin. The design of the curtain may have been made by a professional artist, possibly one who illuminated ketubahs (marriage certificates).